I really intended to be getting my post up about Kira’s big birthday/baptism celebration last month, today, and I will this week for sure, but a new Twitter friend is asking for ideas for a Lego-themed party for her daughter. I don’t know anyone who loves Legos more than my sister, Trina’s boys. Remember thebionicle birthday she posted for me? 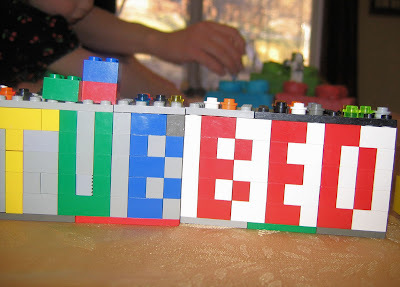 She had some other fantastic ideas from a different Lego birthday I want to share, along with some of my ideas and other fun ideas from around the web. 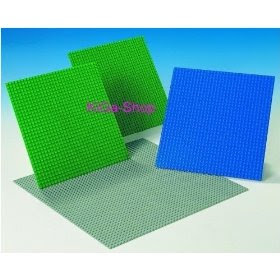 I am much too cheap to do anything like this, but for a table setting, wouldn’t it be cool to use building bases like these as placemats? 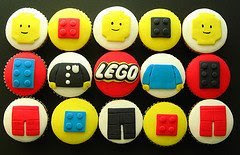 You could stick little Lego figures and/or blocks around each base as decoration and a take home favor. I would just use solid colored partyware, and serve food that would require some sort of “building.” Like make your own mini-pizzas, or build your own layered sandwich. Here are some fun cake ideas. This is the one Trina made. She used this idea from Betty Crocker, using marshmallows for the studs. For some reason, Trina wasn’t thrilled with how her cake turned out, but I love the way she stacked her layers just like you do with Legos. If you prefer cupcakes and/or are skilled with fondant, you could try replicating these cupcakes from Hello Naomi. Trina’s treasure hunt was too clever (and I don’t want to confuse you) so I’m going to copy what she wrote about it! 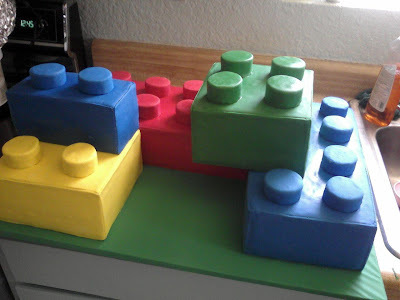 “For Marcus’s treasure hunt, I came up with the idea to give him instructions and legos to build a block that would then tell him the hiding place of the next set of legos and instructions. When he had all four blocks built, he’d put them together to reveal the final hiding place (where his presents were hidden) written in studs on the top (yes, I know, but it really did seem simple at the time). We used a program you can downloard from Lego.com called Lego Digital Designer that lets you “build” a model on the computer. Then you can print out instructions, and even order your creation from Lego. So, in reality, each block took way too many legos to build, the instructions ended up as mini-books, and I was short on time, so we only made three blocks. Even so, the treasure hunt took Marcus and his helpers quite a while to complete. 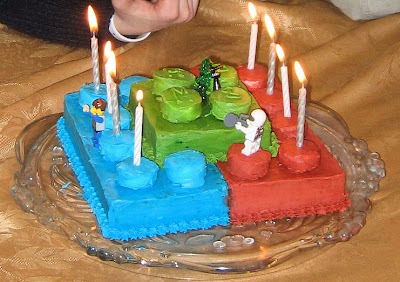 Anyone else throw a Lego birthday? Any other great ideas we should know about? 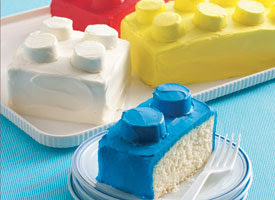 The blog Cake Wrecks just featured some fabulous lego cakes yesterday that you should check out. Thanks, Trina, for the Cake Wrecks heads up! Those are cool. I can’t believe all the wedding cakes. Do you think Guy would have wanted one? What a great roundup of ideas, I’ll be linking. Love this idea! The possibilities are endless! Saw you on One Pretty Thing and your blog is too cute!! My 8-year old is LEGO crazy. He is on a mission to build The City set. His birthday was in May…on my blog is shows what I did. These cakes put mine to shame! I’m so glad to have come across your blog. I immediately hit the “follow” button. You are very inspirational! Please visit my blog and be sure to click the “follow” if you like what you see. I will be adding you to my Crafty Treasured Blog List and if you have a button I will add also. Please be sure to do the same so we can inspire each other often!